Mangrove forests in Sri Lanka are being destroyed at an alarming rate, with no replanting or restoration efforts underway to ensure their preservation and expansion. These shrubs are of high importance to low-lying coastal zones exposed to natural disasters due to climate change, and their loss poses a serious threat to coastal communities and the natural ecosystems. In commemoration of UNESCO International Day for the Conservation of the Mangrove Ecosystem, The Carbon Consulting Company (CCC) and Kitesurfing Lanka (KSL) jointly launched the ‘Kitesurfing Blue Carbon Project’, the first of its kind in Sri Lanka. The project identified suitable areas around KSL’s property to plant and rehabilitate degraded mangroves, and ensure their survival for future forest coverage. 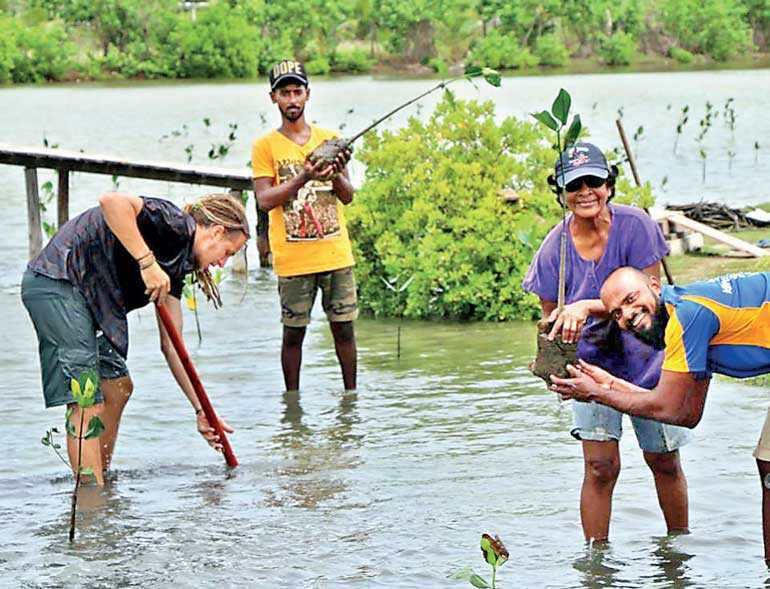 In a joint planting campaign between CCC, KSL, their hotel staff and guests, 1,000 mangroves were planted in the lagoon adjacent to the property. Over the next 10 years, the hotel will preserve the mangroves with a vision of building a ‘Green Wall’ – protecting against tsunamis, cyclones and typhoons – along the property perimeter. Mangroves offer an array of valuable social and environmental benefits that directly impact the sustainable development, resilience, and adaptive capacity of local communities. The project partners with local communities, through active engagement and participation in all stages of the project, with a focus on shoreline protection from erosion, and improved biodiversity with protection of endangered flora and fauna. Expanding the project in future envisions local community members being actively involved in and benefiting from the sourcing, growing, planting and maintaining the newly planted mangroves. Making the mangrove project part and parcel of KSL’s daily operations is an imperative part of the project. In addition to the social benefits the mangrove project will provide, CCC will assess the carbon sequestration of the mangroves – a concept globally gaining recognition as ‘Blue Carbon’, and allocate the carbon sequestrated against the guests’ carbon footprint during their stay at the hotel as an environmental compensation mechanism – another concept making waves internationally as ‘Carbon Insetting’. Kitesurfing Lanka (www.kitesurfinglanka.com) is a tranquil escape from the hustle and bustle of everyday life, nestled in a quaint area in Kalpitiya surrounded by native landscape and just steps away from the Laccadive Sea, and born out of the love of kitesurfing and nature, widely reflected in their sustainability initiatives like banning plastics and undertaking regular beach clean-ups and proper disposal. Apart from their ambitious mangrove project, they are actively involved in community outreach programs to educate the community on sustainable tourism, and establishing vocational trainings to create natural products like Ayurvedic soap, sunblock, and toothpaste, contributing to additional income sources for the communities surrounding the hotel. KSL dreams of becoming 100% renewable, and creating a fleet of electric tuk-tuks to add on to their sustainability portfolio.